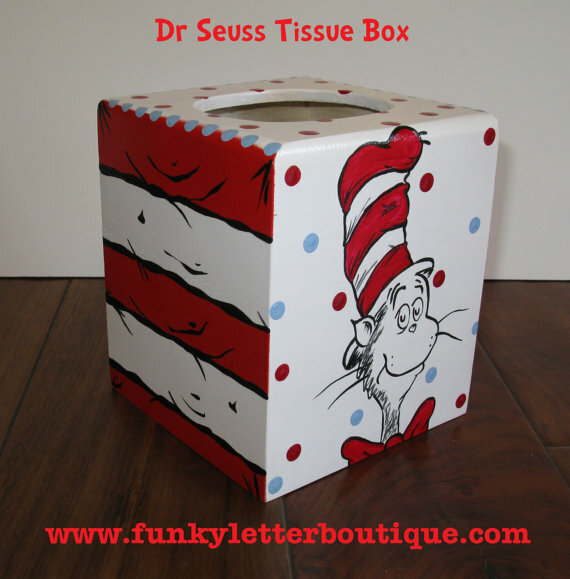 Made to match Dr. Seuss Cat in the Hat theme, this beautiful hand painted tissue box will add that finishing touch to the room! 3 sides are painted in the cute cat in the hat red and white stripe pattern, and front is adorned with the famous Mr. Cat in the Hat himself! This items is hand painted by just me, please allow 3-4 weeks for completion. If ordered with letters this item will ship at the same time as the letters do 8-10 weeks.